Luxor MBS-SR-4L is a Mobile bin storage unit with single row large bins that conveniently store and systematize your daily essentials in Luxor's mobile bin system. The spacious gray bins are available in two sizes and include an area for standard labels that dually operates as a handle for easy accessibility to storage items. Choose from Luxor's five storage bin options and add mobility and ease to your storage drawers. Features: Versatile and functional storage units are ideal for schools, garages, or industrial facilities. Organize and stack supplies in four 6" deep tubs. Single row steel frame is constructed for long lasting use. Built in handle provides easy access to pull-out bins. Simple organization system with area for standard labels. 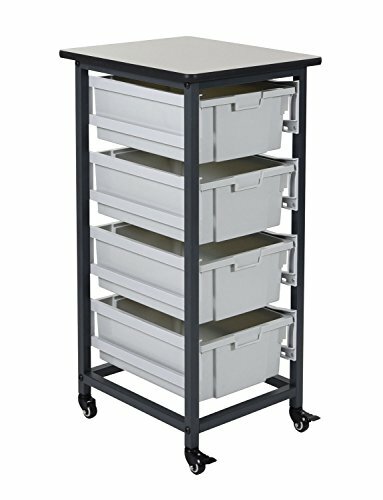 Flat-top surface provides a work area or additional storage. Four casters allow smooth maneuverability, two locking brakes give stability for stationary use. Additional bin packs available: 8 small bins ( MBS-BIN-8S ) 4 large bins ( MBS-BIN-4L ). Dimensions for the bins is 12.25"W x 16.75"D x 6"H.